Angrath is also an interesting multiplayer card – the first and third abilities hit “each opponent,” and the second one is what it takes to launch an unexpected attack. From Ixalan onwards, the “planeswalker rule” has been abolished. However, all past, present and future planeswalkers have earned the Legendary supertype, and consequently the “legend rule” applies – you cannot control two planeswalkers with the same name. We can control at the same time Angrath, The Flame-Chained and Angrath, Minotaur Pirate at the same time, but we can not control two Angrath, The Flame-Chained, or two Angrath, Minotaur Pirate. Let’s take care now of Angrath’s second ability. In order for a creature to be targeted, it must satisfy a single requirement: it must be, in fact, targetable (it must not have shroud, or hexproof, or protection, and so on). Granted this, any creature is fair game: we can target a creature already untapped, in 2HG we can target a creature controlled by our teammate, and we can even target a creature already under our control. We can cast a creature, and use Angrath’s ability only to give it haste. 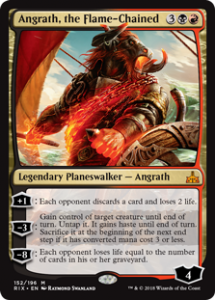 Once Angrath’s second ability resolves, destroying Angrath has no consequence on the controlled creature – the controlled creature always has haste, and at the end of the turn it will still have to be sacrificed or returned to the owner. The second ability of Angrath, in addition to generating an effect that gives us control of the targeted creature until the end of the turn, also creates a delayed triggered ability, which will go on the stack at the beginning of the end step, and make us sacrifice the controlled creature if it has a converted mana cost (CMC) of three or less. For double-faced cards, the CMC is calculated by looking at the “front face” side, even when these cards are transformed, i.e., with the “back face” side up. The CMC of Huntmaster of the Fells is four, and the CMC of Ravager of the Fells is also four. A Ravager of the Fells controlled by Angrath should not be sacrificed. When we sacrifice a controlled creature, it dies under our control, and we will also control the abilities that trigger as a result of this event. For example, if we “steal” a Jeskai Sage from our opponent, when the monk is sacrificed we will draw a card, not our opponent. On the other hand, the creature that dies under our control immediately ends up in the owner’s graveyard, without going through our graveyard. To illustrate what’s going on here: suppose we use Angrath to control one of our opponent’s Zombies. Our opponent controls a Compost. When the Zombie is sacrificed, it does not pass through our graveyard, so Compost does not trigger. The same situation, but we control the Compost. When the zombie is sacrificed, Compost triggers. We can sacrifice the creature only if we still control it at the beginning of our end step. If we steal a creature from the opponent, and they take it back with Vedalken Shackles, for instance, at the beginning of the end step the ability goes on the stack but does nothing – the creature remains on the field. An even more special case is that in which we use Angrath to control a creature with CMC equal to or less than three, and at the end of the turn we forget to sacrifice it. What happened? How is it managed? We simply missed a beneficial trigger. No penalty for us. Our opponents are not responsible for our triggers. They can remain silent, and accept that the creature is returned to them – no problem. If our opponents want it, they can remind us to resolve the ability. If they do it before we pass the turn, we will resolve the ability and we will sacrifice the creature. If they do so after we have passed the turn, the ability can go on the stack, but we can’t sacrifice a creature that we do not control – the creature remains on the field. Well, that’s all for Angrath! See you on the next Card of the Month.